Manu Tuilagi has been named in the England squad to tour Australia next month, despite a hamstring injury that could prevent him from playing. The Leicester centre, injured during Saturday's 44-17 Premiership semi-final loss at Saracens, faces six weeks out. Tuilagi's involvement is "very much in the balance", says coach Eddie Jones. Chris Ashton has been omitted from a 32-man squad containing uncapped players Ben Te'o, Ellis Genge, Kyle Sinckler and Teimana Harrison. New Zealand-born centre Te'o, who will join Worcester from Leinster before the England party leaves for Australia, switched codes in 2014, having represented Samoa in the 2008 Rugby League World Cup and won a National Rugby League title with South Sydney Rabbitohs. He joins prop Genge, who is on loan at Leicester from Bristol, Harlequins prop Sinckler and Northampton back row Harrison in the squad. 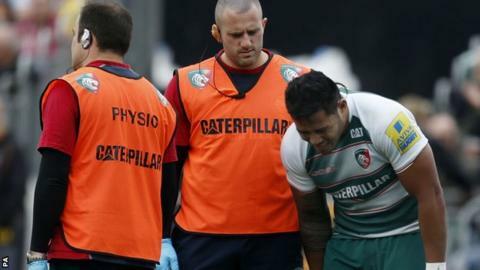 Tuilagi's fitness will be assessed on Monday, and a replacement will be called up if he is not available. Saracens fly-half Owen Farrell, who suffered a rib problem during Saturday's semi-final, is also included in the squad for the three-match series, which begins in Brisbane on 11 June. Northampton's Dylan Hartley, who led England to their first Grand Slam in 13 years in March, continues as captain. Saracens wing Ashton missed this year's Six Nations campaign after being given a 10-week ban for making contact with the eyes of Ulster's Luke Marshall during a European Champions Cup game. He has since helped his club win the European Champions Cup and reach the Premiership final, but has not been included in the England party. "We are still a young squad with an average age of 24 so this will be a big learning experience," head coach Eddie Jones said. "This will be the first time many of the players will have toured Australia so there's no historical baggage there and mentally we'll be in a good place off the back of the Six Nations." Forwards: D Cole (Leicester), L Cowan-Dickie (Exeter), J Clifford (Harlequins), E Genge (Leicester), J George (Saracens), T Harrison (Northampton), D Hartley (c) (Northampton), J Haskell (Wasps), P Hill (Northampton), M Itoje (Saracens), G Kruis (Saracens), J Launchbury (Wasps), C Lawes (Northampton), M Mullan (Wasps), C Robshaw (Harlequins), K Sinckler (Harlequins), B Vunipola (Saracens), M Vunipola (Saracens). Backs: M Brown (Harlequins), D Care (Harlequins), E Daly (Wasps), O Farrell (Saracens), G Ford (Bath), A Goode (Saracens), J Joseph (Bath), J Nowell (Exeter), H Slade (Exeter), B Te'o (Worcester), M Tuilagi (Leicester), A Watson (Bath), M Yarde (Harlequins), B Youngs (Leicester).